Aaron Lewis, Phillip Griffin on Thursday, June 12. Turnpike Troubadours will be led by Breelan Angel on Friday, June 13. Charla Angel leads for Kevin Fowler on Saturday, June 14. PRCA Championship Rodeo inside the Rockin C Arena each night. Mutton Bustin featuring area youth starts at 7:00 each night. Carnival rides each night this week. Tickets are available at Crosby ACE Hardware, Community Bank of Texas, the Fair office, and online at crosbyrodeo.com. 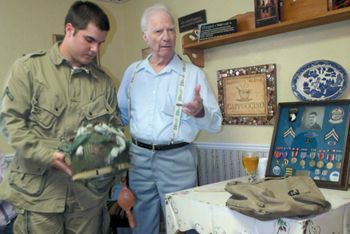 HIGHLANDS June 6, 1944 over 10,000 soldier in the Allied Command paid the ultimate price for their country in the Invasion of Normandy and seventy years later a remembrance of that day was held at Teapot Depot with three veterans of that awesome struggle. Jack Langham recounted for over an hour of the ironies and incidents that befell the 101st Airborne as they regrouped and cut Nazi supply for the 10 days that was the Battle of Normandy and the Battle of the Hedgerows until the Capture of St. Lo. Recounting skirmishes and tank battles, the first thing one learns from veterans is that the movies often got it wrong. The Battle of Carentan was explained in details that caused many to wince. It occurred between June 10 until the 15 between the 101st and the Nazi Wehrmacht. The Germans were thrown back on June 12 but the 17th S.S. Panzergrenadier Division counter atacked supported by tanks. Langham recalls that each American Airborne knew that this group of Nazis were dedicated, would not surrender and would fight until the last man fell. In spite of what many remember from movies,the 2nd Armoured Division with the 101st Airborne were more than a match for the Nazi combined forces. Langham displayed a frame filled with medals including the Bronze Star and recounted how he earned each one that eventful fortnight. He peppered his talk with recounts of battles and the bravado of the airborne troops. Other local veterans joined in the rememberance including Cecil Newton and Grody Hand adding to the vivid discussion of events.